Bitcoin bulls finally got a little bit of good news this week with a blistering start to April. The leading cryptocurrency in the world popped over 20% to break $5,000 for the first time in 2019. The question a lot of people have is: why? The mainstream financial press is always looking for a narrative and it floated stories of a whale making a big buy, etc. Typical stuff. But, in my mind, it was simply just time. Bitcoin and the rest of the cryptocurrency market have been mired in a bear market for 15 months now since the spectacular bubble of 2017 burst. And that’s enough time for the market to become unbalanced enough that it needed a counter-trend correction. To me, political turmoil is creeping up around the world. So the idea of people quietly accumulating Bitcoin below $4,000 doesn’t seem outrageous given how much our financial lives are now tracked. The likelihood of limits on cross-border money flows tightening further if any chaos comes of Brexit, for example, is real. That put the Bitcoin market in a position to test the upper limit of its trading range between $3,500 and $4,100 which has been in place since it broke down below $6,000 in late November (see chart). March’s performance constituted a simple two-bar technical reversal signal by closing above the January high. Not only was this a bullish monthly close but it was a strong close to Q1. Giving hedge fund managers the opportunity to rotate into new crypto positions now that profits for the quarter have been booked. A two-bar bullish reversal is where the price closes above the high of the last down bar in a trend within the next two bars. 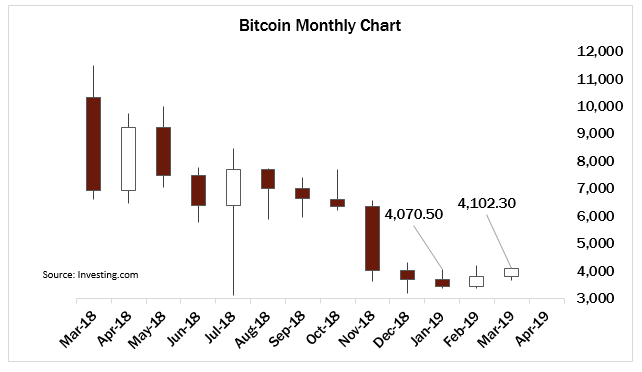 It’s a technical signal that Bitcoin hadn’t thrown on the monthly chart during this 15-month bear market. So with the massive move into safe-haven assets to end March abating somewhat on Monday, it was no surprise to me with this simple setup to see Bitcoin catch a bid and break higher. The question now is whether or not this is a sustainable move or just a bit of probing by long-suffering bulls? While I’m a big fan of Bitcoin and cryptocurrencies in general, I urge caution with this move. This is a relief rally as the shorts had spent all of 2019 pushing Bitcoin down away from $4,000 and failing to break it down further. And markets that can’t go down, eventually go up. So we’ve got signs of life that crypto isn’t dead yet, despite the protestations of the strange bedfellows of both the central banks and gold bugs. To me, someone looked at Bitcoin, saw an opportunity, bought in knowing that some buy stops would be triggered and short covering would take care of the rest. Pushing up to $5,100 under these circumstances also makes plenty of sense since there is practically a $2,000 gap on the chart below $6,000. Remember, Bitcoin broke down in a matter of hours to $4,000 back in November, so there was very little testing of that range by the market. And it only makes sense for that gap to be filled and tested at some point. That point seems to be now. I wouldn’t be surprised to see Bitcoin push towards $6,000 in a second-stage liftoff. And the fact that it hasn’t immediately collapsed back to the breakout point of $4,100 is further proof that bulls may be in control of this market for a little while longer. Bears haven’t been challenged for more than a year. It’s not like we’re talking the strongest of hands here. It’ll take more than a quick pop to balance this market. All of that said, however, Bitcoin is still going to struggle with the after-effects of the bubble burst from last year. You don’t go on a 20-fold run and 80% correction in a little over a year, and then expect everyone to come back into the market eager to get crazy again. Most people haven’t even rectified their losses on their taxes yet. And for an asset like Bitcoin, the return of the retail investor is what will drive any new bull market. For now, you have to handicap that it is in the hands of professional traders. So while I do feel we are entering a period of extreme monetary and political uncertainty, I don’t think Bitcoin is ready by any stretch of the imagination to take on the role to replace national currencies. If you are a HODL’er, secure in your belief in the long-term bull case, I’d keep your emotions in check. I’m happy to be wrong, but skepticism is the right call here. The takeaway for you is that this breakout likely confirms the bottom from January as the bottom of the bear market. And that is the first step toward building the energy and investor confidence of the next bull market. If you’re someone who still can’t quite wrap your head around why Bitcoin even exists, I’d use this week’s price action to check your premises. Some version of crypto will make its way into our financial world in the future. It’s not an indictment of the technology to say, however, that time is not now. It’s the realization that nothing moves in a straight line and for everything, there is a time and place.